A bomb disposal unit had to be called yesterday after police commissioner Katy Bourne found an unexploded World War Two shell in her garden. Katy Bourne said she found the shell while mowing the lawn. Speaking on Twitter today, the Sussex police and crime commissioner said: “Busy day at work yesterday but it wasn’t dull at home either. “Huge thanks to Mid Sussex police and British Army Royal Logistic Corps for fantastic professional response to WWII unexploded shell we unearthed whilst gardening over the weekend. The shell, which can be seen in pictures posted by Mrs Bourne, is about one foot long. Her husband, a former Royal Artillery serviceman and Falklands veteran, and recognised it as a potential anti–aircraft shell or an anti-tank round, the PCC’s office said. 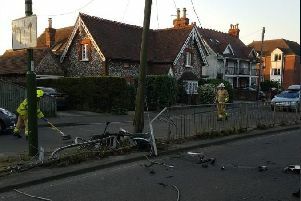 It was safely dealt with by bomb disposal experts, with the assistance at the scene of Sussex Police officers. If you discover a suspected device, leave it well alone and call police immediately.